Windows 8 is the newest version of Windows. You can get it on your Android phone and tablet too. 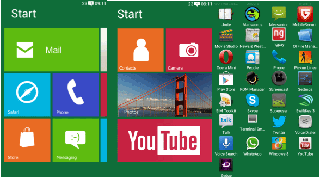 It is a Launcher app which tries to intimate Windows 8 on Android and it offers Windows 8 styled theming on Android. It changes everything in your phone, tablet like icons, themes, notifications and even effects. Homesceen appears like tiled version of Windows 8. These tiles can be used for accessing multiple apps or webpages. The apps will be updated automatically. You can place folders on homescreen in the tile form. The default Start button of Windows is there which opens App drawer. Actually, It is the best way to place most commonly used apps in the form of tiles on the homescreen. There is absence of notification bar as there is no notifiaction bar in Windows . This Windows 8 For Android can turn your Android device into Windows 8 Tablet but live tiles support, windows 8 font can make this app much better. I hope future updates of this app will support these features. You can download Windows 8 For Android at a minimal price of $1.99 in Play Store from here.